WPUF QR Code module generates QR codes based on the information you provide to the forms created using WP User Frontend Pro. You can easily generate the stored information by scanning the QR code! Navigate to your WP dashboard->User Frontend->Modules. 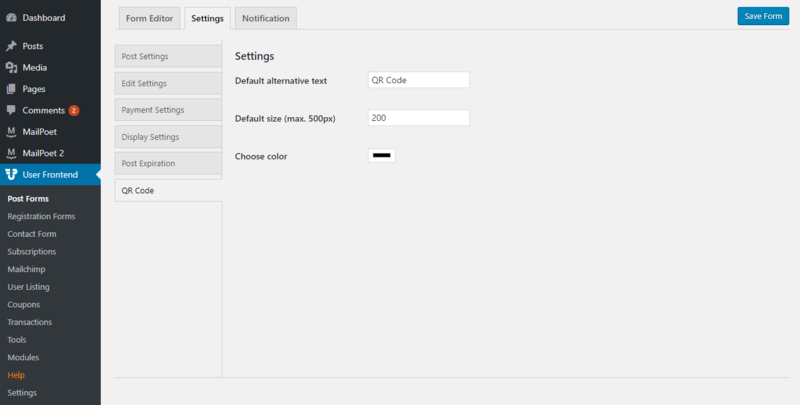 Find QR Code Generator and turn on the toggle button on the top right to activate this module. At first, install and activate WPUF QR Code module as shown above. 1. 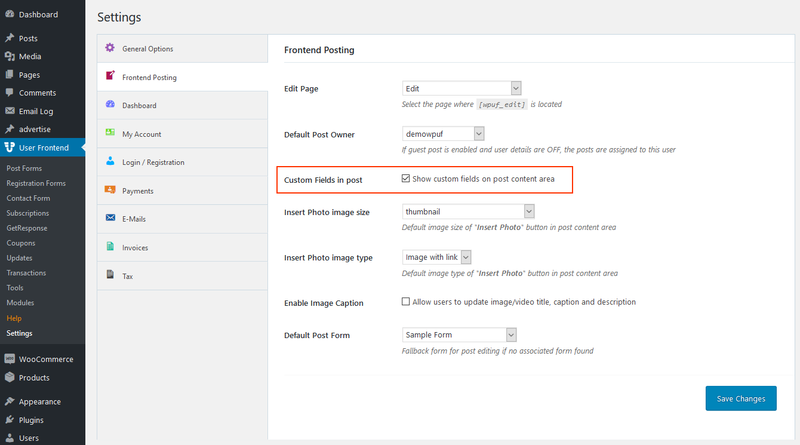 Navigate to WP Dashboard>User Frontend>Settings>Frontend Posting. 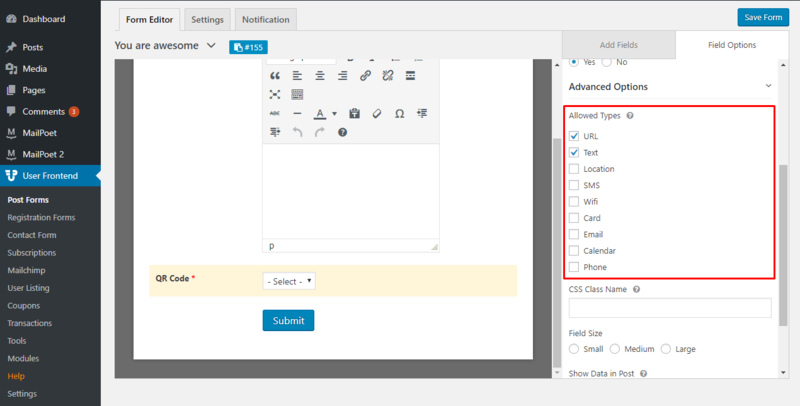 Now ensure that the check-box for Show custom field on post content area is turned on. 2. Next, navigate to- WP Dashboard → User Frontend → Forms. Now, click on the form you want to add QR code or create a new form. Read this documentation on how to create a form using WPUF. 3. After setting up your form, go to Form Settings. Click on the QR Code tab. You will find options to set up the QR code. You can rename the default text and size of the QR Code. 4. 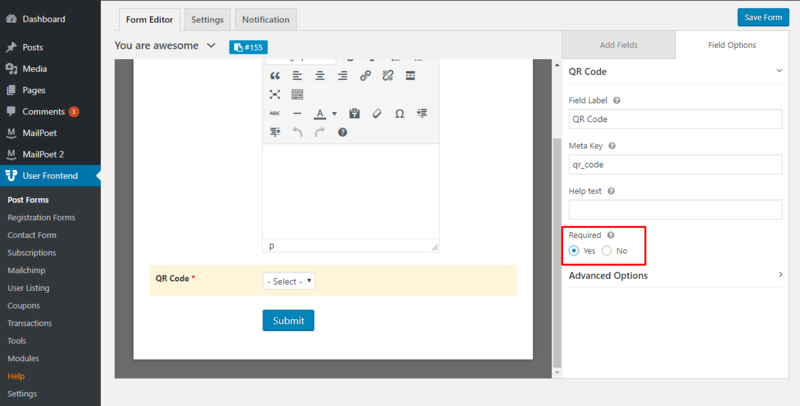 Now, return to the Form Editor tab and add the QR code field from the Others tab. 5. You can change the Field Label and Meta Key. You can also add a Help Text and make the field required or optional. 6. You can also set up Advanced Options and select the type of fields for which you want to allow QR code. There are 9 allowed QR code types available for your forms. You can choose to allow all or some fields. In addition, you can add a CSS Class Name, change the Field Size, Show data in post, and add Conditional Logic. 7. After providing all required information click on Save Form. Now you can preview your form from the frontend. 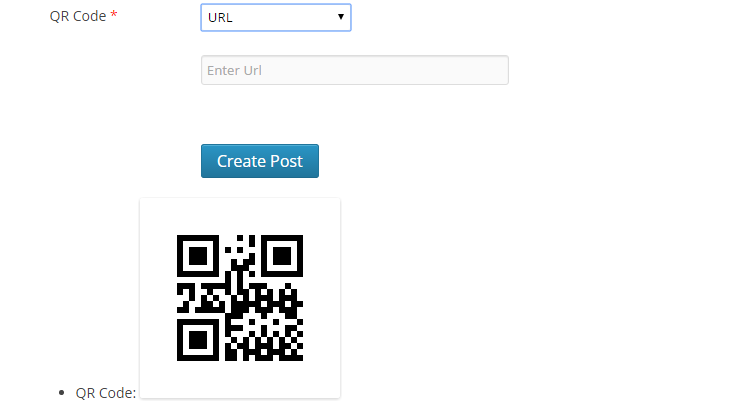 From frontend, you can find the QR code generator inside your form. You will be able to select the types of QR code from the drop-down menu and input required information. Now, click on the Create Post button. After providing information within the QR Code fields and creating the post, you will get a QR Code. You can scan the code and get the information from it easily.